2017 Remembrance Day Service held at the Shrine of Remembrance, Melbourne, Victoria. Image via Commonwealth of Australia, Department of Defence. 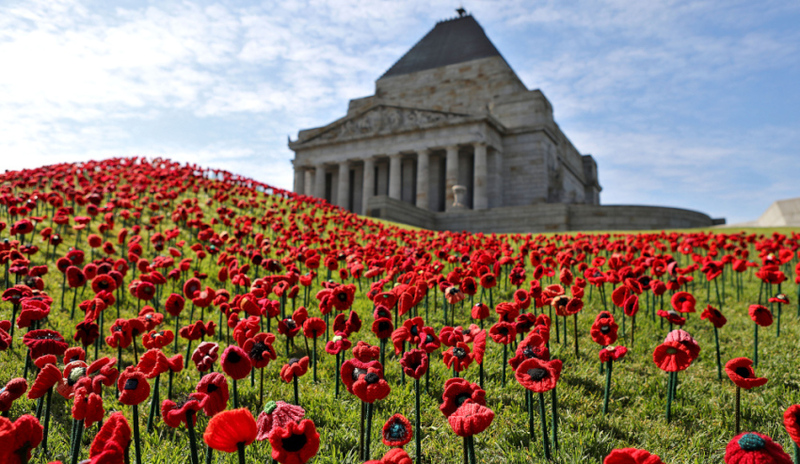 Communities across Australia will receive almost $320,000 under the Armistice Centenary Grants Program to develop 50 projects to commemorate the 100th anniversary of the armistice of the First World War. Minister for Veterans’ Affairs Darren Chester said the round of grants had been designed to support local projects and activities that appropriately acknowledge the end of the war 100 years ago. "The response from the community to the Armistice Centenary Grants Program has been overwhelming and the Department of Veterans’ Affairs is working to process applications as soon as possible," Minister Chester said. "The high level of interest in commemorating this important date in our history is a true testament to the success of the Anzac Centenary 2014-18 and I have no doubt these projects will create a lasting legacy of remembrance." "Examples of successful projects and activities include the installation of monuments, exhibitions and displays; upgrades to existing memorials to include gardens and landscaping; and the development of educational resources such as themed films and publications," the minister said. Installation of a concrete path and flag pole to the Bodangora War Memorial. Produce and perform a musical-dramatic play “1918 Back from the Brink” to commemorate the end of the First World War. Staging of two concerts including a premiere of a special new ‘remembrance’ composition to be performed in Armistice day concerts. Create an exhibition of First World War memorabilia. Hold a commemorative event and create permanent monuments in villages throughout Cobar Shire in honour of service personnel from the First World War. Additional works at the Eumungerie Memorial Cenotaph. Conduct a significant “Centenary of Armistice Day” event at the historic Tambar Springs Cenotaph, and upgrade the grounds surrounding the Cenotaph. A centenary display of photographic prints from the collection of Lieutenant H. Bowden Fletcher from 1 Squadron, Australian Flying Corps, at the Narromine Aviation Museum. Install a water feature and plaque as part of the war memorial and purchase display cabinets for First World War memorabilia. Placement of a bronze plaque on a Cenotaph in Barmedman Anzac Memorial Park, and hold a commemorative service and community event on Armistice Day 2018. To purchase 16 uniforms to be worn by members at parades and commemorative services during 2018 in tribute to First World War service personnel and the Armistice Centenary. To hold a special commemorative service at Breakers Country Club and Terrigal Beach, followed by an opening of a commemorative display featuring First World War memorabilia. To extend the existing memorial garden and provide refurbishment and additional seating to the garden at the Caloundra RSL. Installation of a new flag pole, stone plinth and plaque to commemorate the Centenary of the Armistice and sacrifice of Australian servicemen and women. Renovation of the Bundaberg State High School remembrance memorial garden. Wall mounted presentation of the 15th Battalion that will become a permanent display of First World War memorabilia in the Atherton RSL Sub-Branch building. Produce a digital documentary record of the Armistice Centenary commemoration in Cairns. Carry out a First World War family educational event that directly engages young people in a historical treasure hunt throughout Cairns City on Armistice Day 2018. Complete First World War Centenary projects in the Douglas Shire district, including a commemorative mosaic, poppy display, memorial plaques and upgraded Cenotaph. Installation of a display cabinet for the display of Sub-Branch military memorabilia. To commemorate Armistice with a twilight service and concert event. Beautification of the memorial gardens at the front of the Jandowae Memorial Hall. Creation of a mural to acknowledge the Armistice Centenary and sacrifice of service personnel. Installation of flagpoles and a commemorative plaque at Darra State School. Installation of flagpoles at Kruger State School. Create a commemorative memorial garden at the school. Installation of flagpoles for commemorative purposes. Creation of a memorial wall with commemorative art work and landscaping of monument area. To construct four columns to match the existing memorial columns with decorative metal gates, archway and emblems at The Gap Memorial Park. Purchase of two display cabinets that will house First World War memorabilia. Landscaping of grounds including installation of a plaque, water feature and pavers to create a commemorative garden. Conduct a commemorative service and unveil a plaque dedicated to the cessation of hostilities on the Western Front 100 years ago. Install a flagpole, plinth, plaque and lighting at the RSL. Restoration of the Memorial Cairn and Cross of Remembrance. Undertake a Woodend Armistice Day Re-Enactment of the events that occurred on 11 November 1918. The production and showing of six First World War films on and around Armistice Day. Replace a panel over the Mansfield Memorial Gate arch, polish the granite panels and re-gild the names of First World War service personnel. Create an Armistice Centenary memorial garden. Construct a memorial garden commemorating First World War service personnel from the Berwick community who attended the old Berwick Boys Grammar School. Create six dioramas that depict life in the trenches and the effect of the war on the home front. Research, collect and publish stories of First World War service personnel listed on the First World War memorials in the Pakenham district. Create and install a new honour roll for the Foster War Memorial Arts Centre. Create a new honour board for the Hall and hold a public celebration for the unveiling. Research and publish a collection of stories of First World War service personnel from West Gippsland. Install security lighting for illumination and protection of First World War carvings and restore the memorial garden. Construct a steel memorial poppy statue at Portland Bay School's new campus. Install three bronze commemorative plaques. Erect of two adult sized metal silhouettes 'Soldier on Guard' to complete the existing War Memorial. Erect flag poles and install two cast bronze plaques as a commemoration of the 100th Anniversary of the Armistice. More successful grant recipients will be announced over the coming months.